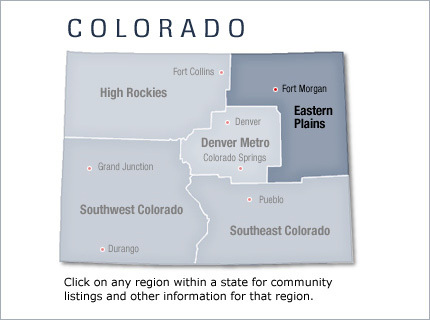 The Eastern Plains of Colorado refers to region of the U.S. state of Colorado on the east side of the Rocky Mountains, and east of the population centers of the Front Range. The Eastern Plains are part of the High Plains, which are the westernmost portion of the Great Plains region. They are among the most sparsely populated areas in the continental United States. Most of the Eastern Plains region lies within Colorado’s 4th congressional district. Even though Colorado is considered a quintessential Western state, this region is often considered the Midwest.